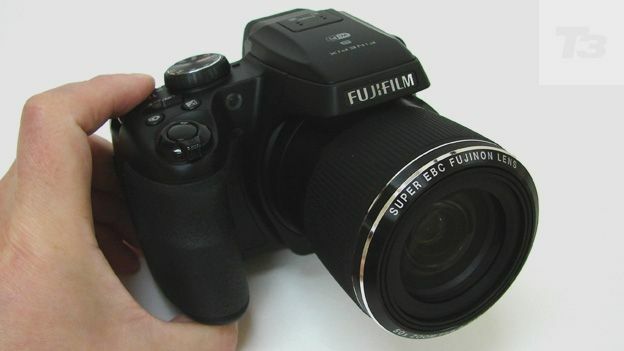 The 16 megapixel, 50x optical zoom Fujifilm S9400W bridge camera - or 'super zoom' - was launched at the start of 2014 alongside two other very similarly designed and featured models in the flagship S1 and the lower-end Fujifilm S9200. Of the S9000 series models, the S9400 individualises itself via the W suffix, denoting that this is the Wi-Fi-enabled model. The pricier Fujifilm S1, which also offers a rechargeable lithium battery rather than the alkaline AAs supplied with the S9400 and S9200, is similarly Wi-Fi enabled, but by contrast doesn't like to shout about it. As with its S1 big brother and S9200 little sister, the mid-range S9400W offers a creatively expansive focal range the equivalent of 24-1200mm in 35mm film camera terms. That's quite something allowing everything from group portraits to close ups to be achieved without the photographer moving an inch in either direction. We found that the ability to toggle back and forth from a static position without getting in anyone's way was a boon. Lens aperture varies from a maximum f/2.9 for shallow depth of field type shots to an all-encompassing f/6.5; the smaller the f value the more light the lens lets in. Like the S1, Full HD video clips at 1920x1080 pixels and a frame rate of up to 60fps can be recorded at the press of a dedicated one-touch thumb-operated button on the backplate. Alternatively there is a 10 frames per second burst shooting available in stills mode, or 480fps shooting in video mode, that when replayed allows for a sequence to be viewed in slow motion. Likewise shared is an ISO12800 top light sensitivity setting plus 16 megapixel back-side illuminated CMOS sensor that's the standard issue 1/2.3-inches in size, as opposed to the more preferable one inch or indeed APS-C sized chip found in the budget DSLRs the S9400W outwardly apes in its angular construction. Both the S9400W and S9200 do differ from the flashier S1, however, in that distance markings are provided on the lens barrels of both cheaper models - only revealed when the lens is extended towards its telephoto end. This is such a nice touch we do wonder why it's a trick the pricier S1 missed. That said we're not surprised to discover that the S9400W offers 'only' JPEG stills rather than uncompressed Raw files; but at this price its potential audience isn't going to care. And the cost of the big lens, yet small sensor incorporating S9400W? A suggested £269.99, as opposed to the S1ís £399.99 and the S9200's £249.99. All three go up against Sony's new budget super zoom addition in the 63x H400 at £249.99. So how does the Fuji shape up as a standalone mega zoom? The control layout of the S9400W is quite similar to the mash up of point and shoot and DSLR-style controls found on the S1 camera; except that a wide handgrip on the S9400W has allowed the incorporation of a sliding switch to turn the camera on or off rather than a simple button press. There doesn't seem to be an advantage we can think of with opting for one over the other, though, other than a switch looks a more clunky solution than a simple button. The S9400W's shutter release button, which is encircled by a lever for operating the zoom, sits marginally higher up on its handgrip, and it's missing the DSLR-like command dial at the top right-hand edge of the camera's backplate offered by the S1. We also don't get a dedicated Wi-Fi button on the backplate of the S9400W that we do with the S1. But it does match that camera in that a second means of adjusting the focal range is provided via a zoom lever on the left of the lens barrel itself. Otherwise the bottle-top style shooting mode dial atop the S9400W is again identical to the S1. Here we get the creative choices of program, shutter priority, aperture priority and manual modes, plus custom, panorama, scene modes, Advanced modes (including digital filters). We also get regular auto and scene recognition auto - the camera selecting which pre-sets seem to best match the scenes you're attempting to shoot - so, in other words, the usual mix of manual and fully automatic shooting options. While the S1 offers a high-resolution tilting screen, with the 3-inch LCD on the rear of the S9400 you're stuck with your bog-standard fixed variety. This means that when pressing an eye to the viewfinder ranged directly above said screen, your nose unavoidably butts up against the LCD, since it can't be swung out of the way. Not a deal breaker, but a practical concern nonetheless. The screen resolution is a mid tier 460,000 dots, as opposed to the S1's semi-pro 920K dots. The S9400W, like the S9200, further offers an electronic viewfinder for eye-level shot composition. But this is both physically small and offers a lower resolution of 200k dots, so is only really there in an emergency should sunshine render the main screen tricky to view. Though if you sat the S9400W alongside the pricier S1 iteration you'd be hard pressed to outwardly tell the difference on a quick glance over the two bridge cameras, the former reveals its budget status by virtue of the four AA batteries that slot into the base of its handgrip to provide power, rather than the more common rechargeable lithium-ion battery, offered by the S1. According to official CIPA test figures, the four alkaline cells included with the S9400W out of the box provide enough power for 300 photos. This isn't bad at all, and is an exact match for the competing Sony H400's 300 snaps from a rechargeable battery, but falls short of the 350 captured by the S1. Having, theoretically, a very wide range of framing options at our fingertips is all very well on paper. Inevitably, despite the lens shift image stabilisation on offer, it's tricky to hand hold the camera steady enough at longer focal ranges to avoid blur in our images, unless conditions are particularly bright and clement. As a result the performance of the S9400W can be a bit hit and miss. Low light is also an issue, and as we found with the S1, a small sensor means that noise/grain intrudes at ISO800 and upwards, which means that you'll want to stick at a modest ISO400 for a clean-looking image. This isn't much of a shock and with this list of specifications offered at this price it's far from a disaster either. However more discerning (and less cash strapped) photographers may well want to look at pricier all-in-one options such as the Sony RX10, which produces more obviously pro-like results, yet at a massively increased cost. Ultimately with the S9400W we are getting what we are paying for. Razor sharp images are less of an issue when shooting video and thankfully here the full extent of the optical zoom can be deployed, and relatively quietly too, unless you're filming in a quiet room. Built-in stereo mics sit above the viewfinder and if you're going to be watching videos back on your desktop then quality is fine. Ultimately you're shelling out £20 more for the 16-megapixel, 50x optical zoom S9400W than the almost identical S9200 model for its inclusion of Wi-Fi. And you're spending £130 less than the more impressive S1 because the S9400W lacks a provided lithium-ion battery, has lower resolution screens, and omits a hotshoe. The sensor is the same physical size at a standard 1/2.3-inches in all three new 'S' cameras, as is the headline resolution, so you pay your money and make your choice. Ultimately though, if you need that amazing focal range to place a broad range of framing options at your fingertips, don't mind an image quality not much better than your standard snapshot and haven't got much cash to spare, then the easy-to-use S9400W is not without recommendation.